Here is the study you need to learn for the core studies exams. Haney, C., Banks, W.C. & Zimbardo, P.G. 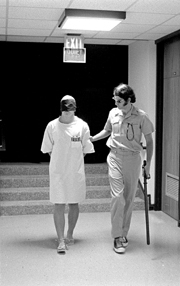 (1973) A study of prisoners and guards in a simulated prison. Naval Research Review, 30, 4-17. Everything else on this page is extra stuff that you may find useful and interesting. The glossary has a brief summary of the Zimbardo study. You can also find all of the past exam questions on Zimbardo's study here. Here is a multiple choice quiz and here is a cross-word. 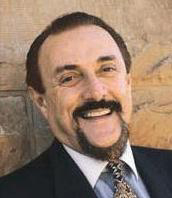 Phillip Zimbardo has his own groovy web site - Zimbardo.com. On this site you can find a link to his prison experiment which really is essential viewing. And read Erich Fromm's critique of the prison study here. 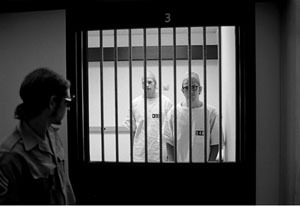 You can buy the excellent classic studies dvd from online classroom which includes original footage from the Stanford Prison Experiment. This video also features reflections from Zimbardo and gives an honest account of the ethical issues that arose in his study. You can view a taster of the above video here. The Clash fought the law - but the law won. Here is Tommy Gun.